The Texas summer is upon us, and this can mean new issues arising concerning your vehicle. If you don’t want car troubles to ruin your summer plans, remember to check your engine’s cooling system regularly. Please note that the engine cooling system is not the same as the air conditioning system, which keeps the interior of your vehicle comfortable for you and your passengers. Problems with cooling can lead to your vehicle stalling out, and may even result in irreparable engine damage. Keeping your engine cool and functioning properly can prevent you and your family from getting stranded in the sweltering heat. Engine overheating: If your engine temperature gauge is creeping higher – or already in the red – or if you see steam/smoke coming out from under your hood, it’s time to take your car in to a professional. Leaks: Check your garage floor, driveway, or parking space for any suspicious coolant leaks. Low coolant levels can cause your engine to overheat faster. Sweet odors: Antifreeze has a sweet smell to it. If your vehicle leaks a sweet-smelling liquid, bring it in immediately for repairs. A dry engine: Low oil levels or old oil can prevent your engine from properly lubricating, which can lead to excessive heat and friction. Remember to stay on top of your oil changes to keep your engine working smoothly. Low Coolant: Another cause of an overheated engine, low coolant levels mean that your engine is operating at a temperature that is far hotter than it should. 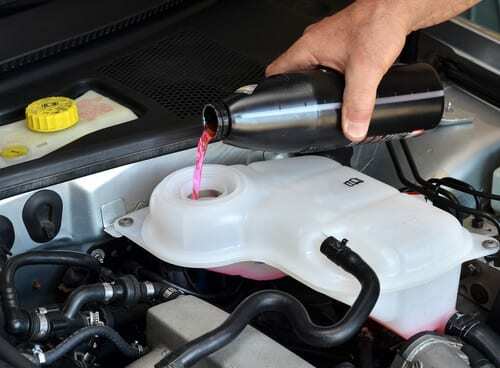 When checking your coolant levels, do so with the utmost care and caution. Start with a cold engine (one that hasn’t been on in a while) to reduce the risk of steam burns. You may only need to top off the coolant levels, but it is important to have a professional check for leaks in the line as well. Fans and Fan Belts: In hotter summer temperatures, engine cooling systems may need an additional boost from a fan. Malfunctioning or broken fans won’t kick in when they need to, and can lead to overheating. If your vehicle has fan belts, check those to ensure they’re in the right condition to power the fan. Lack of system pressure: Pressure is needed to push coolant through the system, and things like damaged or missing gaskets can decrease the amount. If you are concerned that your car cooling system is damaged or would simply like to have us inspect your vehicle before your next road trip, Colony One is here for you. Request a service with us, and we’ll help make sure that your vehicle can beat the heat this summer.